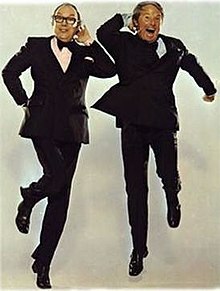 Morecambe & Wise got me fit. I know Joe Wicks is the current go-to fitness instructor (apart from the man carved from orange plastic on ‘Love Island’) but I had Britain’s beloved comedy duo help me on the road to fitness. I was working with Morecambe & Wise on a shoot and Eric, who could be quite annoying because he was hyperactive and exhausting to be around, warned me that I was getting fat. I was probably about twenty seven at the time, and was working insane hours, eating badly and getting out of shape. ‘You’re going to be dead before you’re thirty,’ Eric said, poking me in the stomach. Ernie told him off for being rude (something I imagine he had plenty of practice doing) and I wondered whether Morecambe was on the autism spectrum – but his warning sank in and I joined a gym. Gym training is insufferably boring if you have a busy brain, but I used the time to download and reorder ideas, and continued going pretty much continuously from twenty seven until I was fifty, when I switched to a personal trainer, and finally now carry out my own shorter regime every morning. It’s odd to think about the advice I received from various mentors over the years, and how much of that I took on board. I wish I’d gone to university (especially as you were given generous grants to do so then! Sorry, Millennials) because I’m a bit of a mental sponge and love absorbing data. My advice and tutelage came from showbiz folks rather than philosophers and classicists. But I’m rather glad it did. Are we humans so incredibly irrational that well intentioned, life saving advice is considered rude? Another item to add to my really don’t understand list (together with the use of hyphens). I’m wearing a Morecambe and Wise themed t-shirt as I write this. It depicts a 1960’s ice cream van, moving at speed. Inside can be seen the shadowy figures of Eric and Ernie. The caption underneath reads: (and anyone of a certain age will know full well what it says) “He’s not going to sell much ice cream going at that speed.” This comes from a Morecambe and Wise sketch, where Eric Morecambe hears a police car, looks out of the window, and says the above line. Thats why I always loved their show – on the surface, it was a traditional TV entertainment show, but with an underlying manic energy, and more than a touch of surreal whimsy. Stars of the day begged to be allowed on the show, just to be made to look like idiots by Eric and Ernie. Shirley Bassey, singing a song on a set with an uncompleted stairway, losing one of her glamorous shoes down a hole, and having it replaced by Eric and Ernie, with a workman’s steel toecapped boot. And continuing as if nothing had happened. That sort of thing. People turning up on the show just as it finished, and being unceremoniously cut off. That’s why Morecambe and Wise were so loved. You never knew what would happen from week to week. And, like ‘Dad’s Army’, they still after so long, make me laugh. Yes absolutely right Ian. Lots of today’s comedians acknowledge what they took from M + W.
But the pressure there must have been on all if them particularly Eddie Braben to produce such a standard of work. People actually measured how good their Christmases were by the M+ W shows. That’s unbelievable. Can’t measure anything against it in modern tv. Those shows were like the crown jewels of BBC tv schedule particularly the Christmas specials. Did you work for them as a writer Chris? I well remember my gran laughing her dentures out after reading the badly spelled and spurious credits of a play by Ernie Wise. One ‘Wot he had wrote’, of course. I always think of Chris writing his novels in just the same way as Ernie producing his great literary works. I know it’s wrong but I just do. Having just read your latest post maybe not so different after all! Again apologies to Ernest Wise (now sadly no longer with us) ‘re the comparison was not at all fair no one could write like wot you could sir. I’ll always love M&W’s making breakfast sketch. No jokes, no slapstick, but a perfectly timed, balletic, warmth.